We want our city's investments to be 100% dedicated to the future we want, not funding companies that are undermining our futures. We want a stable climate, fewer wars, healthy children, clear air and water, a switch to wind and solar energy, green jobs, stable energy costs and energy independence, cleaner governance, more land for food and forests, stable investments and quieter cities. Worldwide, cities like New York, Paris, London, Melbourne and Cape Town have committed to divestment from fossil fuel companies and fossil fuels. It's great that Johannesburg has already committed to becoming an emissions-free city by 2050. Now it’s time for it to take the next step – and divest from coal, gas and oil. Our region is extremely vulnerable to damaging climate change. City managers say we're experiencing "frequent floods, drought, heat waves and extreme thunderstorms", and that "significant increases in both temperatures and rainfall in Johannesburg over the next forty to fifty years" are to be expected. The other impacts of climate change on Africa will also affect us: likely increasing food costs, increased disease rates, increased violence, sea-level rise and increased migration by climate refugees. Climate change is caused mostly by emissions from burning coal, gas and oil. These fuels also have many other negative direct effects on our economy, such as heavy attendant water use and pollution, and health impacts from air pollution costing up to 6% of GDP according to a UCT study. Even if you don't care about climate change, fossil fuel investments still threaten your future. Most fund managers ignore risks beyond a five-year horizon. But the world's biggest investment manager, BlackRock, argues all investors need to reckon with "a swelling tide of climate-related regulations and technological disruption". The value of pensions and investments is also threatened by possible stranded assets – the imminently unusable reserves and infrastructure of fossil fuel companies and utilities. The use of fossil fuels, once beneficial, is now almost invariably associated with pollution, social instability, corruption, warfare, threats to wildlife and natural habitats, and spiralling energy costs. It's way past time to replace them. Numerous studies show the world can and must transition away from fossil fuels to renewable energy and a sustainable economy over the next 25 years. 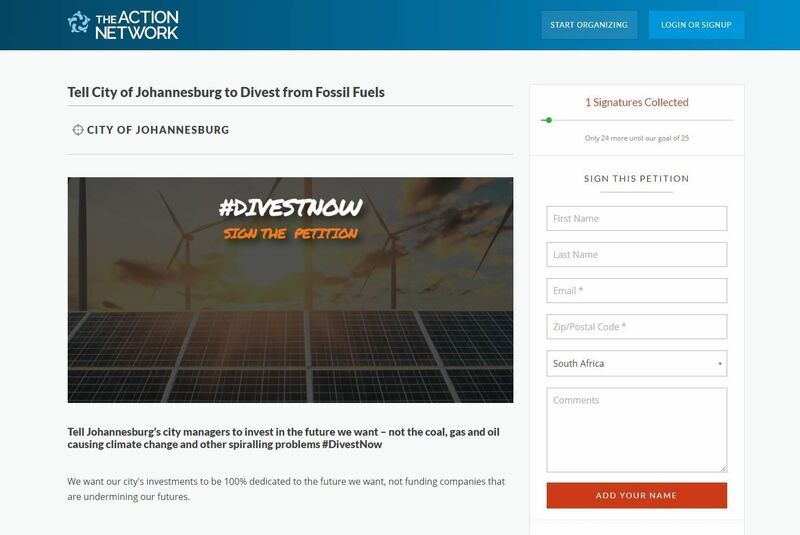 We call on the city of Johannesburg to phase out all investments in coal, gas and oil companies by 2023. Restore with Mother Nature - © 2019.